An elegant oasis in the heart of Munich - Munich Flair - Mediterranean Touch. Are you looking for relaxation on your business trip? Would you like to discover the many faces of this cosmopolitan Bavarian -city with heart-? Would you like to recharge your batteries? To relax, and at the same time, not miss out on the action? 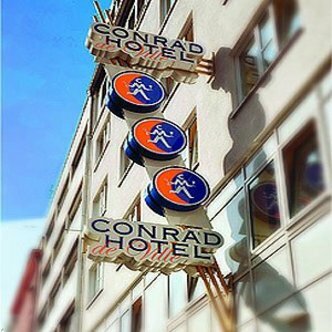 If so, you have just discovered your new home-from-home in the lively heart of Munich - the TOP CityLine CONRAD-HOTEL de Ville MUNICH. // Restaurant, Bar, 24-Hour Front Desk, Newspapers, Garden, Terrace, Non-Smoking Rooms, Elevator, Safety Deposit Box, Soundproofed Rooms, Heating, Gay Friendly. Room Service, Meeting/Banquet Facilities, Babysitting/Child Services, Laundry, Dry Cleaning, Bicycle Rental, Packed Lunches, Car Rental, Tour Desk, Fax/Photocopying, Ticket Service. You have the choice of 89-times space to live, breathe and feel at home. Or would you like a little something more? The Junior Suites for business, la dolce vita and holidays with the family? We have 12 of them. After your first visit you may well describe it as charming, its style Mediterranean, and its garden idyllic. You might praise the breakfast buffet as excellent, and find our staff warm and friendly. One thing our establishment will not do is leave you cold - except for on hot summer days.